A former ballet dancer and surfing enthusiast, Polish-born designer Marysia Dobrzanska Reeves has created a luxury swimwear brand that epitomizes poolside style. The line, launched in 2009, eschews trendy prints and typical cuts for perfectly executed silhouettes in premium fabrics. Having spent most of her life in either a ballet leotard or a wetsuit, she has created a totally modern style that’s always fresh and effortless. Marysia’s bikinis, maillots, and cover-ups can be seen on the beaches of Montauk to Biarritz. We are big fans of the entire line, but have been swooning heavily over the scalloped cuts and printed mommy and me sets. 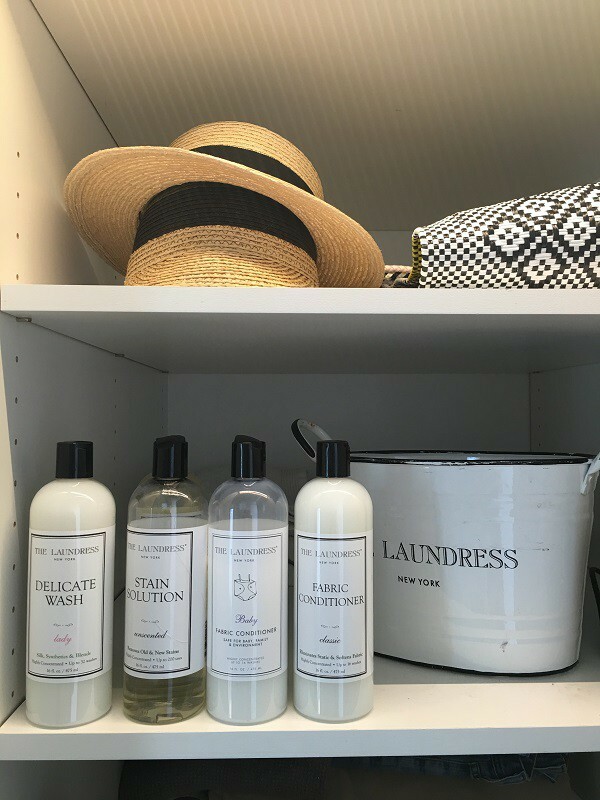 Marysia shares a look at a day in the life of her laundry room in the Los Angeles home she shares with her family. Wash things by hand, wash colors separate, pre-wash.
Having cute laundry detergents that are good for the environment. Getting bad stains out of kids clothing with The Laundress All-Purpose Bleach Alternative and the Stain Solution.